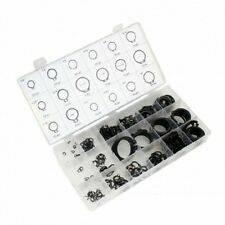 120Pcs 304 Stainless Steel E-Clip Retaining Snap Ring Circlip Kit 1.5mm to 10mm It is a 304 stainless steel E-Clip assortment kit. 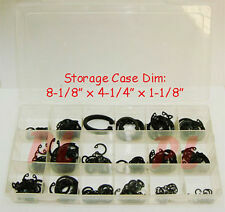 Features: Size: 1.5mm E-Clip(12pcs), 2mm E-Clip(12pcs), 3mm E-Clip(12pcs), 4mm E-Clip(12pcs), 5mm E-Clip(12pcs), 6mm E-Clip(12pcs), 7mm E-Clip(12pcs), 8mm E-Clip(12pcs), 9mm E-Clip(12pcs), 10mm E-Clip(12pcs). 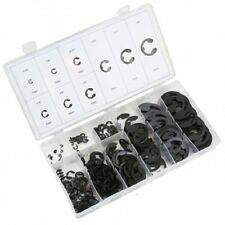 Package Included: 1 box(120pcs) E-Clip. Sizes: 30x 1.5mm, 30x 2mm, 30x 3 mm, 30x 4mm, 30x 5mm, 30x 6mm, 30x 7mm, 3 0x 8mm, 30x 9mm， 30x 10mm. - Contains a wide range of popular sizes. This international order may take longer to arrive. 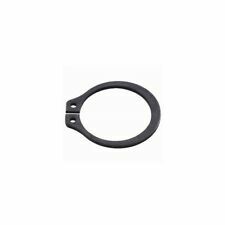 Item Retaining Ring. For Shaft Dia. External Rings fit into the groove of a shaft. The portion of the ring that protrudes from the groove holds the assembly in place. Type External. Material Steel. 300X Circlip. 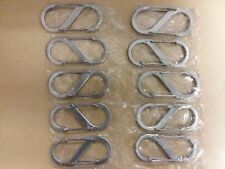 Anyone who has worked with this style of clip knows they. 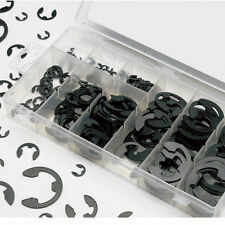 This handy set contains 6 popular sized snap rings for a wide range of applications. Each clip is constructed of durable spring steel and has a black oxide finish to resist rust and corrosion. Trending at C $12.05eBay determines this price through a machine-learned model of the product's sale prices within the last 90 days. Johnson FH13A Antimony Seal Ring ! NOP ! Size app: M1.5 Outer Dia:0.4cm,Inner Dia:0.12cm,Thick:0.04cm. M2 Outer Dia:0.5cm,Inner Dia:0.17cm,Thick:0.04cm. M3 Outer Dia:0.7cm,Inner Dia:0.23cm,Thick:0.06cm. M4 Outer Dia:0.9cm,Inner Dia:0.35cm,Thick:0.08cm. 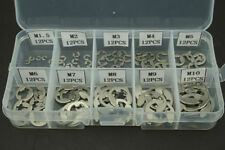 McMaster SH-212ST-PA Rotor Clip Retaining Ring ! NWB ! Fastener Type: 'E' style External Retaining Ring. Grade/Material: Stainless Steel (PH 15-7, PH 17-7). We will respond with the requested information quickly. Specification 60# High Carbon Steel. Heat Treated. Fastener Type: External Retaining Clip. Part Number: SH-62 SS. Grade/Material: Stainless Steel (PH 15-7, PH 17-7). We will respond with the requested information quickly. 10 new military surplus Nite Ize #3 S-binder, 25 lb capacity. Type : Internal Retaining Ring. Quantity : 350 Pieces. PART NO. : HO-118 ST PA ( Alternate to: N5000-118 & RR3000-118 ). Plating : ST PA. Mfg : Rotor Clip. Made in : USA. Matte Black Color. - CNC Machined 6061-T6 Aluminum Alloy.